1 - bring players the ultimate arcade gaming experience. a cabinet designed to provide the controls, screen and sound at optimal positions to interact with. This is important as arcade gaming is a connected and intense experience, something that modern gaming with multiple controls played sat from the sofa lacks. 2 - enable players to experience a revival of games distilled down to their purest form. where the simplest of graphics and sounds are full of character and pixel perfect reactions and split-second co-ordination is required. 3 - complement modern interiors while still having that retro cool look that will make it a show piece for any space. 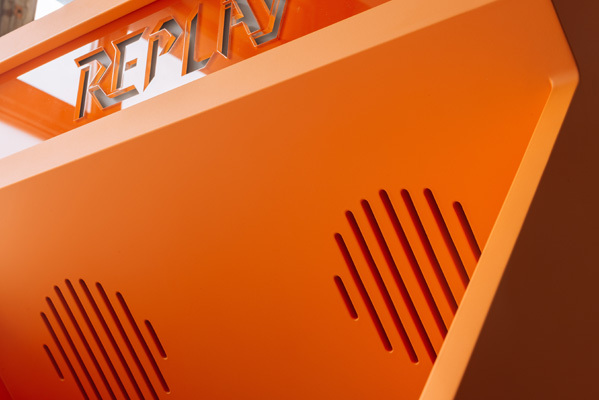 REPLAY is the modern interpretation of how an arcade cabinet can be made, a design of simple clean lines that has been built to the highest specification. The overall size is 1550mm tall by 640mm wide by 610mm deep - the form strikes the perfect balance between being a solid, robust volume and also being able to sit well within domestic surroundings. Utilising the skills of master cabinet maker & professional paint sprayer to achieve a seamless design, REPLAY is made by hand from start to finish. The REPLAY arcade cabinet requires a precise level of workmanship with each cabinet taking several weeks to complete. Whether produced with a one or two player set-up and numerous action buttons, the control panel will still offer a clean, uncluttered layout with no visible fixings or gimmicky extra add ons. Despite REPLAY being a relatively compact design for an arcade cabinet, two players can comfortably play side by side. The horizontal plane of the control panel ensures that precise joystick movements are possible and the arcade industry-standard components give an authentic experience and are of excellent reliability. Using the old technology of cathode ray tube monitors is no longer a viable option, so STOA use modern LCD monitors with a scanline generator - this produces a black line every other line on the display to replicate the lower processing power optimisation technique that has been used by game developers on arcade machine screens for the past 40 years. The added scanlines create a softening effect on the graphics making them look less jagged. The LCD monitors used in REPLAY have an aspect ratio of 4:3, so games are not stretched out and stay true to how they were intended to look. Speaker slots above the screen put the sound right in front of you. A discrete volume knob at the rear of the cabinet gives the option to set the sound level perfectly: turn it up loud and fully immerse yourself in the arcade experience. Control panel set-up - 1 or 2 player. 1 player for high-score hunting older games, 2 player for newer cooperative or competitive games. Joysticks and buttons are available in a variety of colours. Paint scheme and surface finish - there are hundreds of colours to choose from, to suit or stand out from the intended environment. Each REPLAY is fully tailored to a client's specification and production usually takes 8 weeks from the point of design sign-off to delivery. REPLAY is made in London, UK and is available to ship worldwide.